Keep your older children safe in the car by using a booster seat. Most people think once their child is eight years old, or even younger, that they are safe to ride in the regular seat belt. I too thought that and I was ready to let my eight-year-old and 9-year-old boys abandon their booster seats. I thought they were tall enough to ride in a regular seat belt but through research, I learned some important information that made me rethink my decision and my boys will be staying in their booster chairs a while longer. I recently attended the Type-A Parent west conference and met with the nice folks from Diono. They had many types of car seats and booster seats on displayed in the sponsor hall for us bloggers to view. I learned a lot about car seat safety from them and about the different types of car seats they sell. I really liked that they had seats that grow with your child from birth all the way to 57 inches and 100 pounds( the average height and weight of an 11-year-old.) They even had boosters that fit kids up to 63 inches and 120 pounds. Diono had a giveaway and I won their radian r100 seat. I just love that this seat converts to a booster to keep my older child safe. This seat can be used rear-facing from birth all the way to 100 pounds and 57". My son seated in the chair is only 51" tall and 54 pounds so he can use this seat for a couple more years. My son thinks the chair is comfy and loves that the seat belt does not itch his neck. 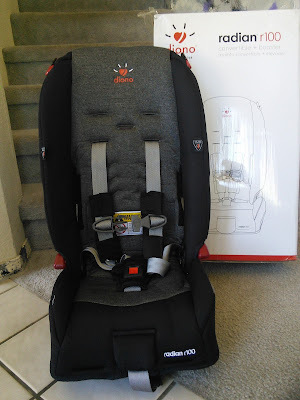 I found this seat easy to install and loved that Diono even had videos on their site to help with the installation, as we all know that makes the seat safe. This seat allows my child to be safe in the car and be comfy at the same time. The sleek and narrow design of the radian r100 also allows for 3-across fit in the car so they are perfect for growing families. Here are some websites that explain why bigger kids should remain in the booster longer. I thought it just had to do with height but I was wrong. There is way more to consider with keeping your older child safe in the car. Check out the Five Step Test for more information. The first link shows why a tall 8-year-old should still be in a booster. I just love the pictures that explain the reasons. The second link gives great information on car seat safety for all ages. So please read the info and keep your child safe in the car. If more parents were informed about car seat safety than older children would not feel embarrassed riding in a car seat. My boys know their safety matters and want to sit in boosters. To get more information on the car seat that my son is sitting in and many others, click on the below links. "These opinions are my own and I received the Diono car seat from a giveaway. I was not required to write about it but chose to do so to inform people about car seat safety." What an important safety post today. I thought it was height, too. I'm not sure parents get this, so I'm happy you decide to inform them. This post is so great! I have a young son and I need to keep him safe. Yes so much so yes! People think I am crazy but I did the research and yes they do need to stay in the seats! Scary how many parents rely on information that they've only "heard." But, your post actually shows how to keep kids safe in the car. This was much needed. This personally seems a bit unnecessary to me but it is great to see people truly care for their child's safety! Oh, this is so nice. I never thought that they need booster too. Our eldest is out of a booster seat now, earlier than I would have liked, but because we can't fit three car seats in the back of the car. Informative post though! Wow it is amazing that you won their booster seat as it looks fantastic! Great way to promote car safety too. Shoot, I still need a booster seat! I am short - ha! I never thought about that before. It makes a lot of sense, kids still need to be safe even if you think they're old enough to not have a booster in the car. It definitely seems like they can sit independently when they get bigger. You're right though. I'm for keeping them in as long as possible. I didn't realize how long a booster was needed. I love how this one looks. It looks comfy enough that I would want to sit in it! It is so true that people don't know that this is truly what needs to be happening with the booster seats. Keeps them safer for longer. I do not have children but if I did the longer the better in the boosters. You never know what may happen with them not being in one. I am trying to remember when I took the kids out of their seats since I have some that are older, but it wasn't for a long time. Great advice! I was really surprised to learn how long kids in North Carolina, where I live, have to stay in a booster seat. I really thought that my daughter was old enough to go without one when we moved here. I found out differently only a short time after being here. Luckily, I didn't get a ticket. 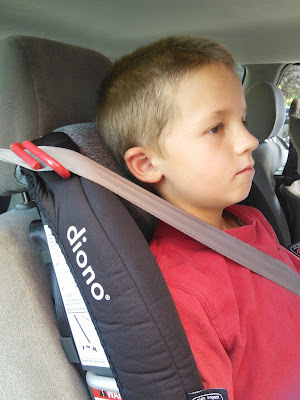 I've heard great things about Diono car seats but I've never had the opportunity to try them out. 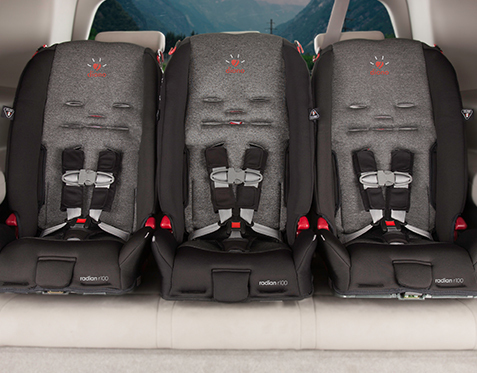 We are definitely pro extended car seat everything! A useful post for many parents. 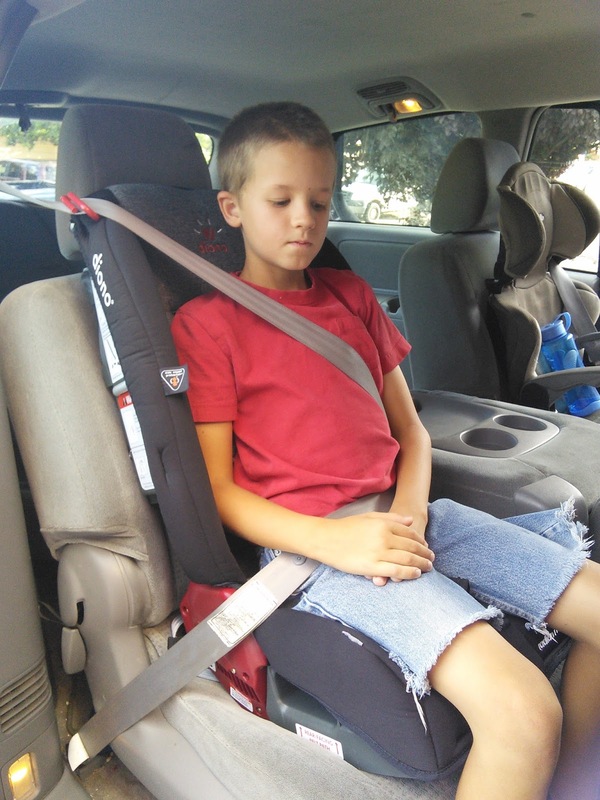 I think parents and kids alike are too eager to see their kids move on from booster seats. This Diono car seats look really sturdy! I say keep 'em in as long as you can. THey're just little guys even if they feel so big. Better safe than sorry. I found that out when my little boy was growing. If it keeps them safer, keep them in longer! Safety is always first for me specially for my son. Looks like your son is enjoying the seat while having safety! Their safety is the most important thing. Yes keep them longer as you can. This post is worth sharing. Very useful! Thanks! I never thought about that before. My son could not fit in the booster seat since he was 5, he has always been very tall!!! Great post! !